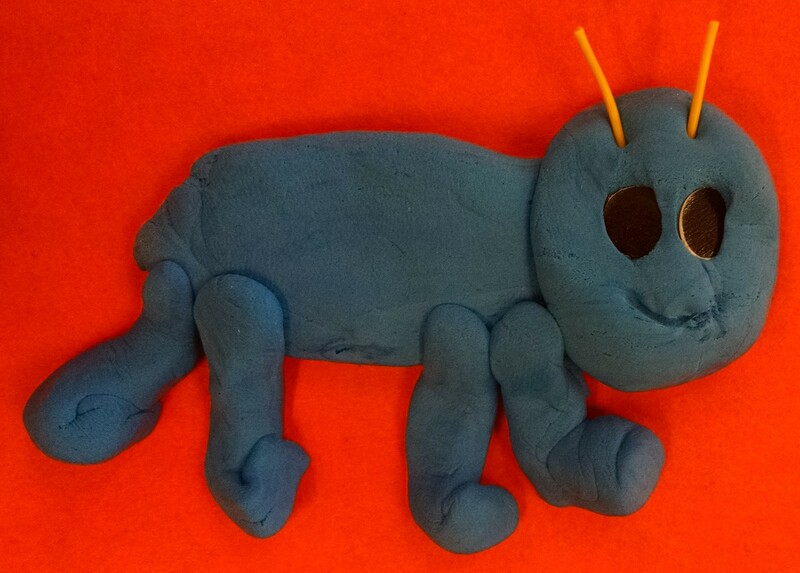 Model Magic bugs: Using Model Magic clay (learn more here), kids could roll three balls, squish them together till they stick, and then push in 6 pipe cleaner legs for the insect of their choice, or two balls with 8 legs for a spider or lots of balls and some antenna for a caterpillar. They could use sharpies to draw in details, or could add googly eyes. The air drying clay shrinks just a tiny bit as it dries, and I found the legs stayed attached to the ladybug with no problem, but as you can see a few of the spider legs got loose enough to fall out. So parents might need to glue some legs back in at home after the bug dries. 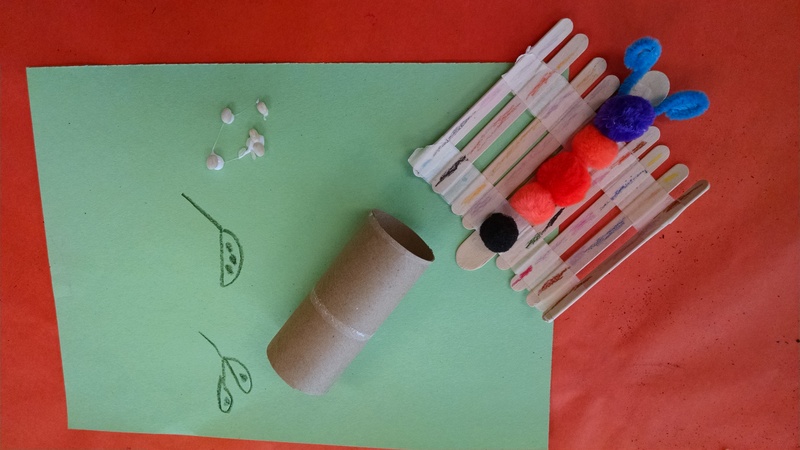 Fold Out Butterfly: This craft starts with a pom pom caterpillar. Then you tape on craft sticks so they can fold up against the caterpillars sides. So your caterpillar can grow, then spread its wings. For the one of the left, this idea came from Danielle’s Place, where she has a great description of the steps for making it. We only suggested this one to our oldest kids (age 6 and 7) because it was over the head of our littlest ones (age 3 and 4). 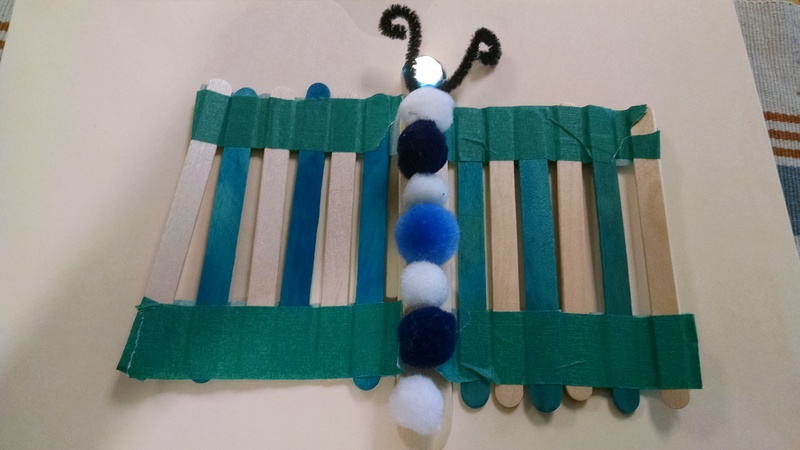 The wings accordion fold into a stack you can hide under the caterpillar. 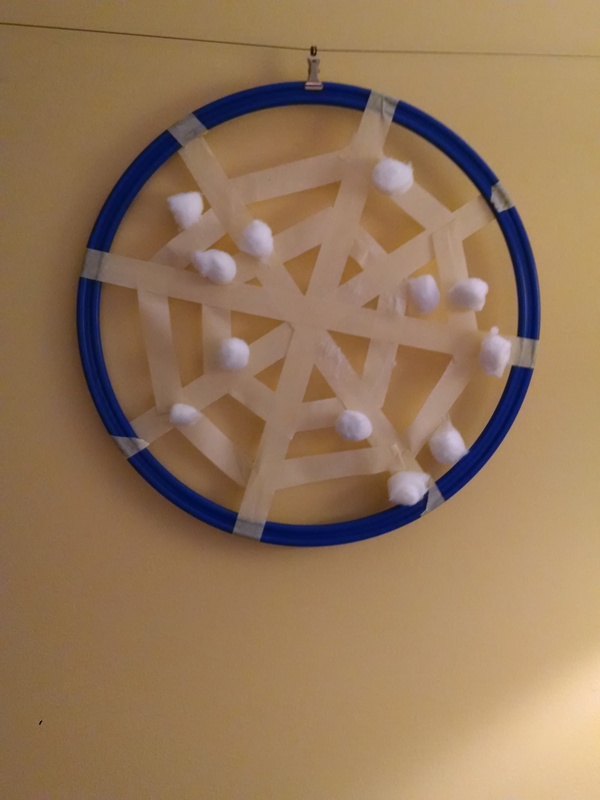 My co-teacher made this sample at home, where she only had blue masking tape. She used oil pastels to cover that with the drawing. Beige or white tape would work better. The one on the right is a simplified version. 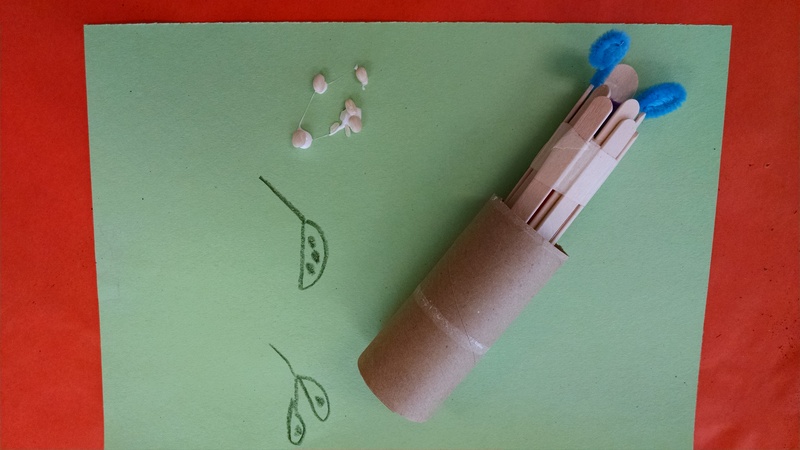 To get the accordion fold to work, you have to be pretty precise… this other is a little easier, and you just roll the wings up around the butterfly as shown in the small pictures, which let you tuck the butterfly into a “cocoon” toilet paper roll. Paper Plate Roly Poly. Another idea from Danielle’s Place – check there for full directions. 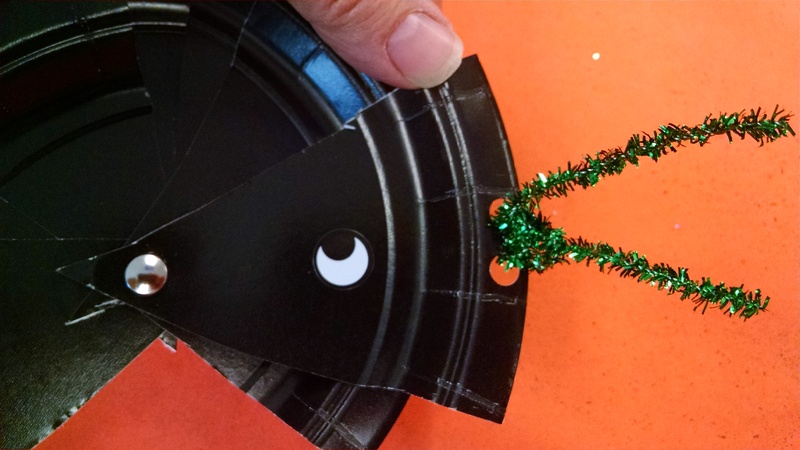 She recommends making it with triangles of cardboard, but we just cut a paper plate into triangles. Then you fasten with a brad, add antenna and a smile, and tape on pipe cleaner legs. This rolls up into a full circle like a roly poly bug does when you poke at it. 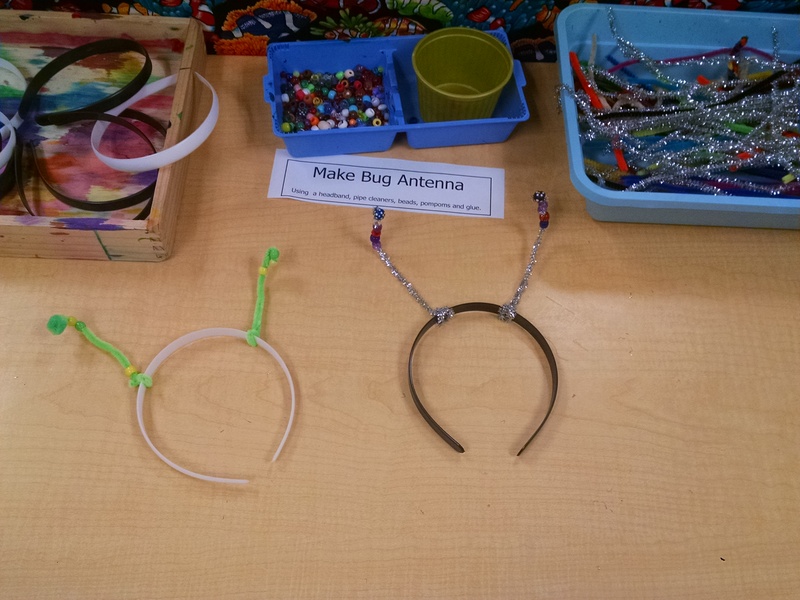 Tip for the antenna… I’d been gluing them on, which wasn’t working great, but one of my six year old students figured out it worked better to punch holes, and twist the antenna through them. I love getting ideas from my kids! Next year, I want to at least bring pictures of one in with me, or I may capture some live ones to bring in for the bug zoo. 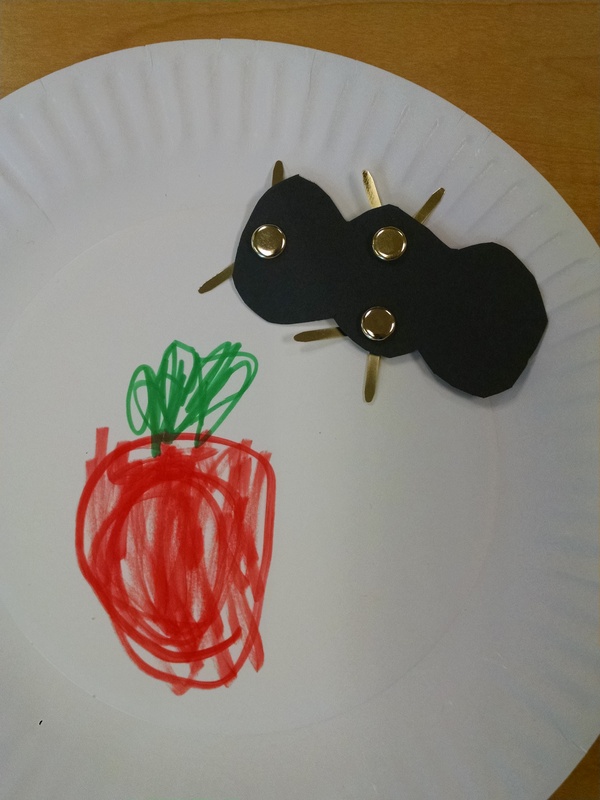 Magnetic Ants: Cut an ant shape from black paper. Add three brads, and fold them out to make 6 legs. These are to use with our picnic plate project below. 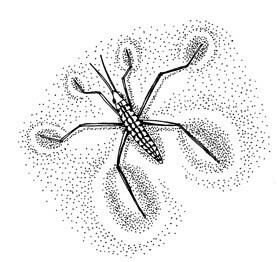 Water strider: These are the bugs that “walk” on water. I really wanted to make a water strider that would float / stand on the surface of the water to play with in the water table. (This also ties into next week’s theme, which is Sink/Float, and where we may walk around a pond with water striders on it.) 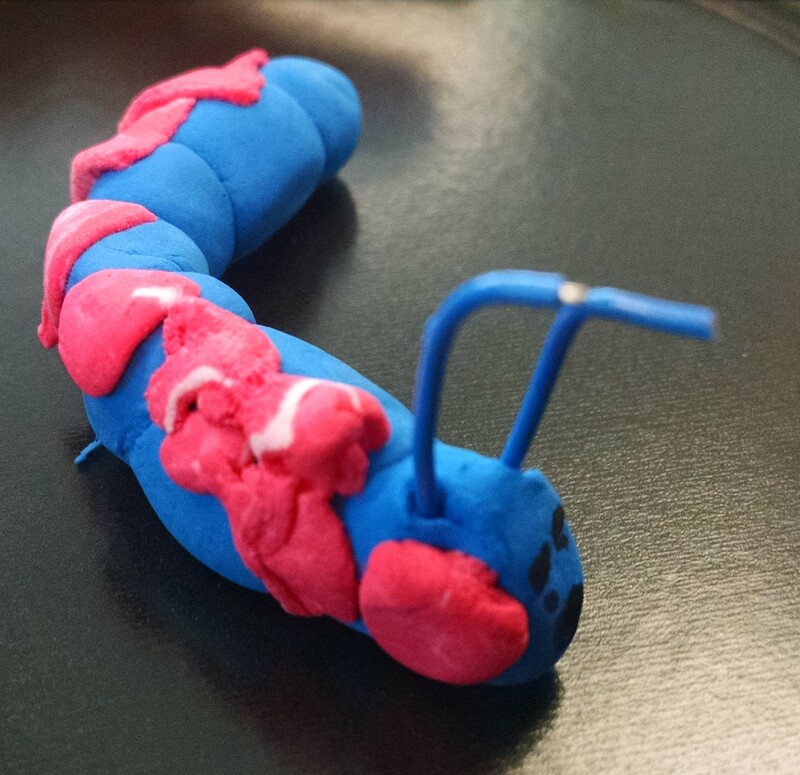 I made one with Styrofoam (from a takeout container) – I didn’t get a picture of it, but it was a bug body of Styrofoam, with pipe cleaner legs taped on the bottom, then 6 little Styrofoam feet glued on to the pipe cleaners (having big feet is not scientifically accurate…. water striders have little hairs on their legs that help them stay on the surface – the hairs capture air bubbles and repel the water). It floated fine… until a kid played with it and dunked it under the water… once the pipe cleaners got wet, they were heavy and it no longer floated. We tried making one with wine corks and toothpicks. We had hoped to cut up the cork to make feet, but that didn’t work – it might work with corkboard feet. Getting all the feet to line up on the same plane would also be important for making it float. This is our next challenge. 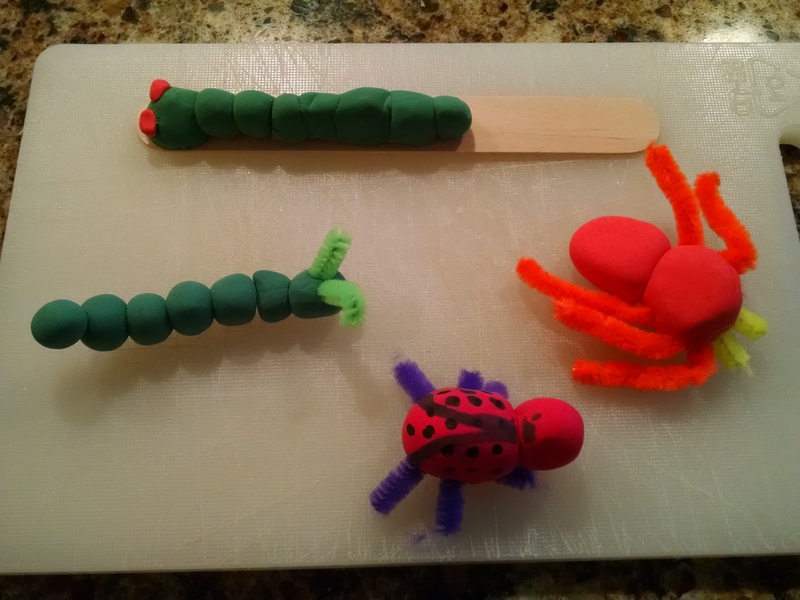 Egg Carton Bugs: If you have egg cartons saved up… Kids can use one segment of the carton and pipe cleaners to make a daddy long legs, or two to make a spider, three to make an ant, 4 – 6 to make a caterpillar. You can paint them if desired. Just search Pinterest for “egg carton bugs” for lots of examples. 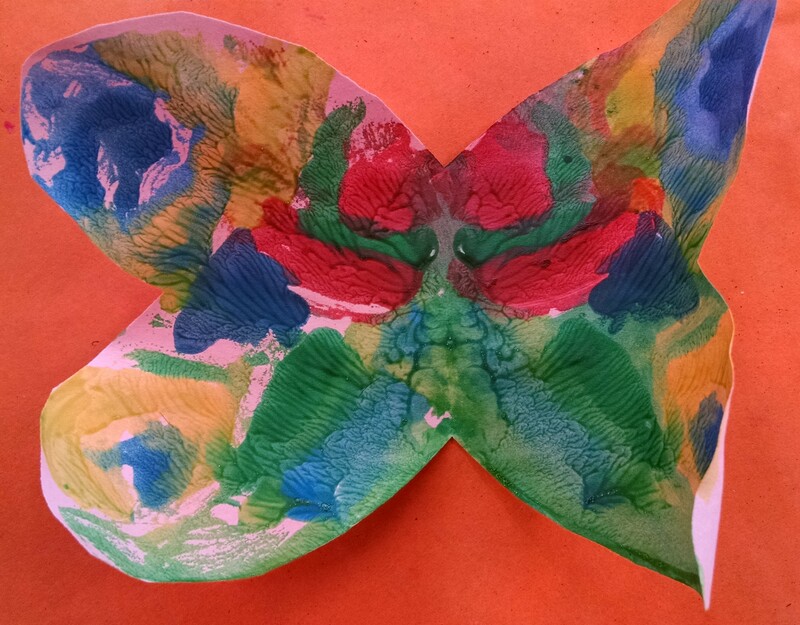 A Rorschach Butterfly: cut out paper butterfly shapes. Fold them in half. 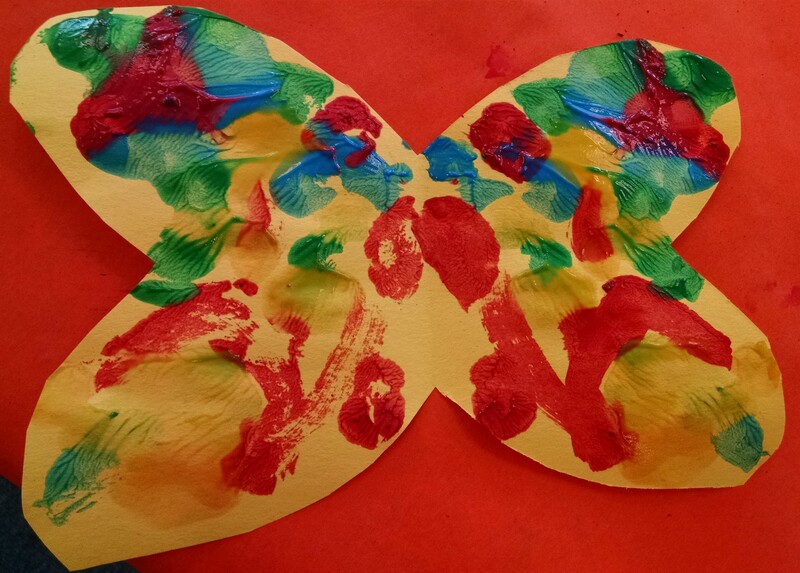 Have kids paint on one half, then fold it in half, press together to transfer paint and open it up again to reveal the symmetry of the two sides. 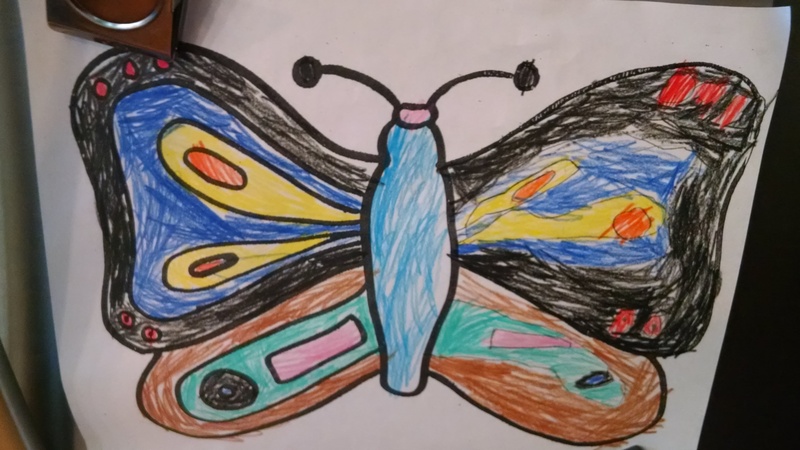 For children age 5 and older, a great symmetry-learning project is to design a coloring sheet where on one side you have shapes that the child colors in. On the other side, they have to figure out where to draw the shapes so they’re symmetrical and then color them in to match. Here’s a printable coloring page for you. 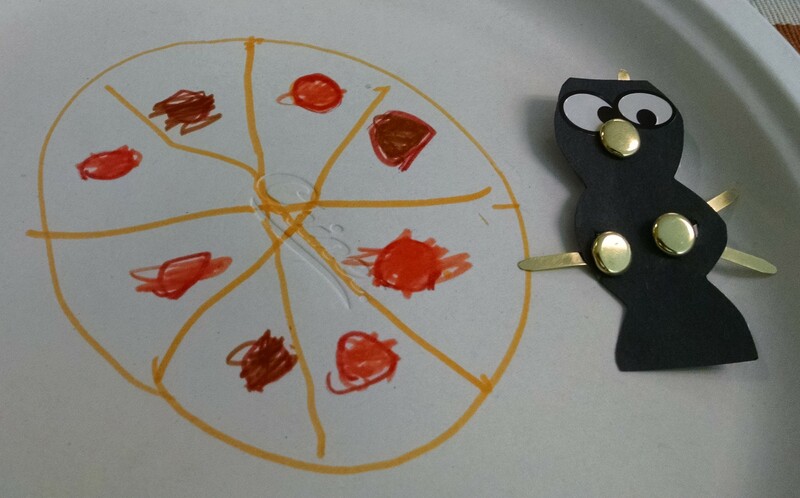 Paper Plate Picnics: Decorate a paper plate by drawing your favorite food. Then put on a magnetic ant from the bug factory. 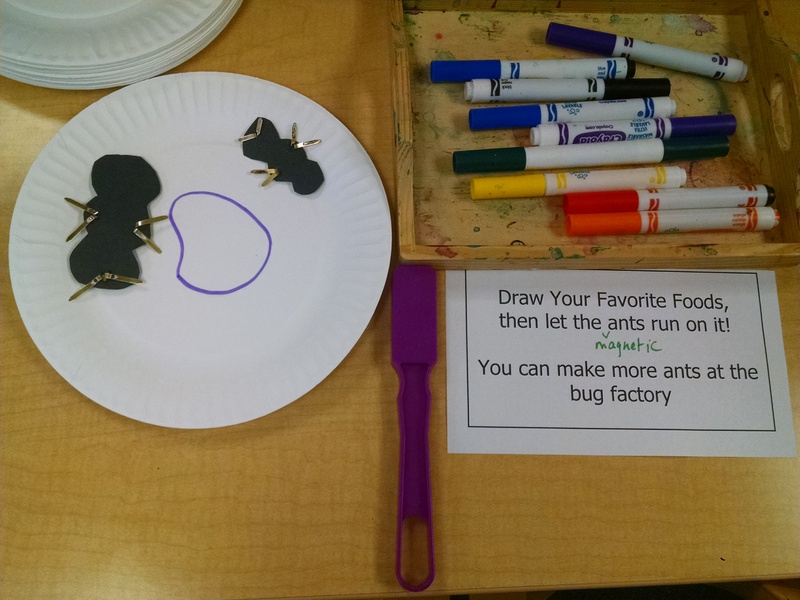 Hold a Magnetic Wand under the plate and make the ant run around on the food. 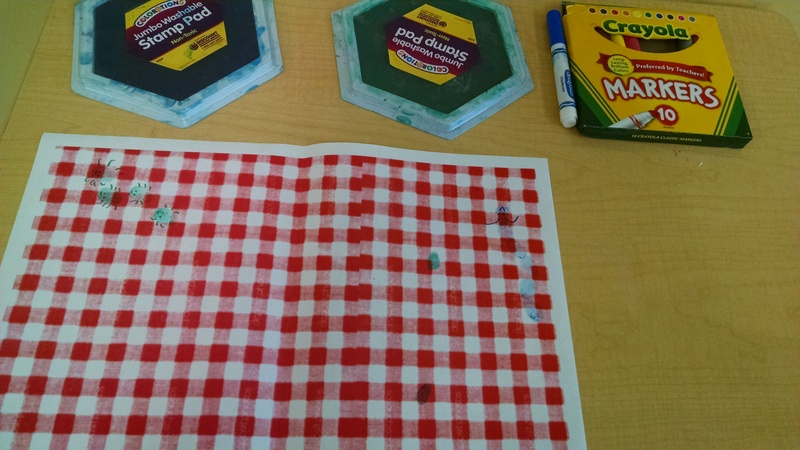 Bugs at a Picnic: Print a picnic blanket design on a piece of paper. Put it out with a stamp pad and markers. 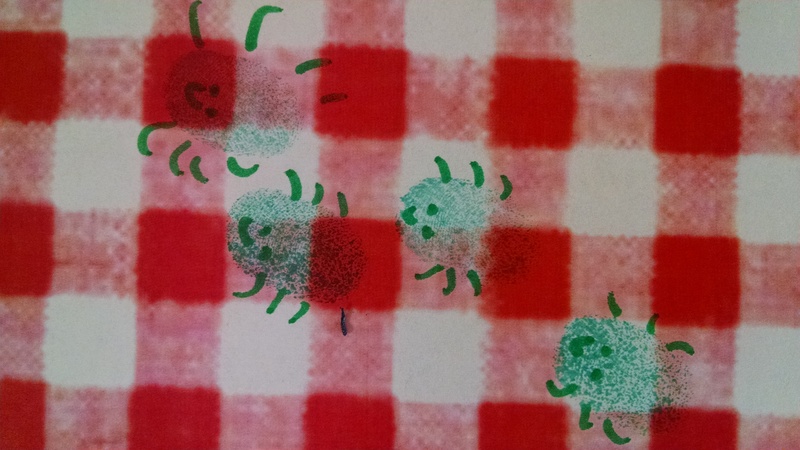 Kids make fingerprint bugs all over the paper, using the markers to add features. 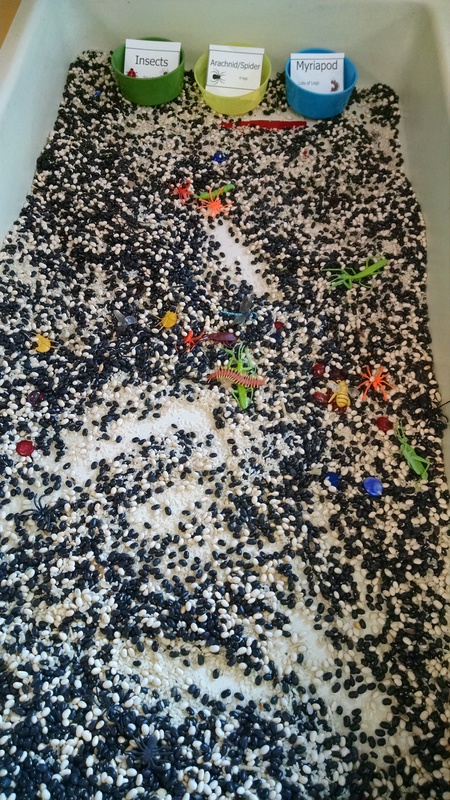 Sensory Table: Bug Sort: We buried plastic bugs in a sensory material. 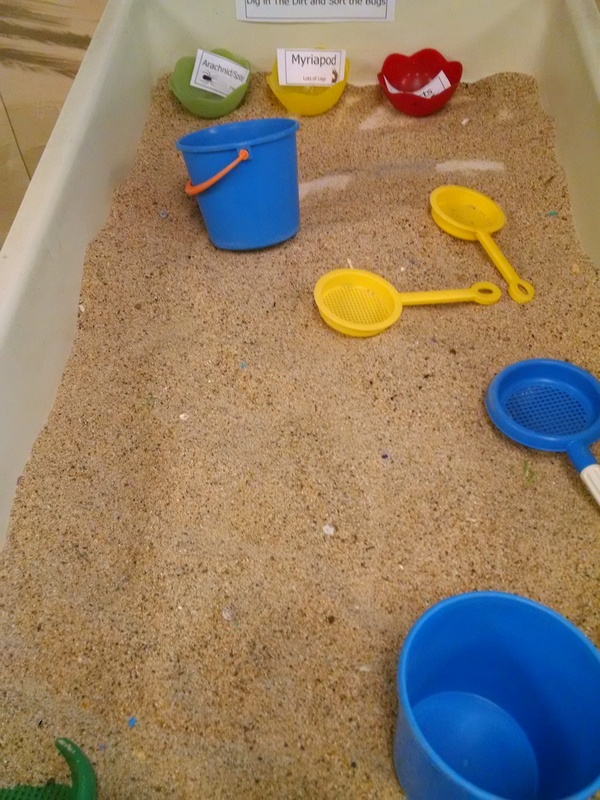 (We’ve used sand, and black beans and rice before. This year we used coconut coir fiber. Learn about it in our Seeds and Plants post.) Kids would unbury the bugs, then sort them into three dishes: insect – 6 legs, arachnid – 8 legs, or myriapod – lots of legs. Then throw cotton balls at it, pretending they’re flies who are flying around and get caught in the web. If a child throws and misses you say “hurray, the fly got away.” We’ve tried this in the past with pompoms, and they would often hit and not stick which was discouraging. (If you’re working with 5 – 7 year olds, you might get a good ratio of hits and misses, but with our little ones who don’t have great aim, we needed to make this easier.) Cotton balls stuck much better, although over time, they left fluff all over the tape which would eventually make it less sticky. 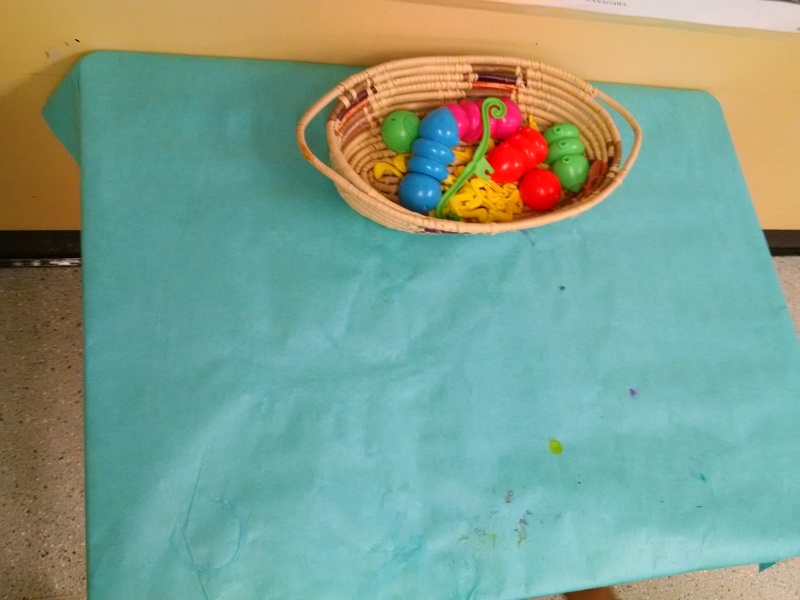 Other theme related activities: We’re blessed to share a classroom with a preschool art program that’s had about 20 years to accumulate fun puzzles, games, and building toys, so we put some out each week. 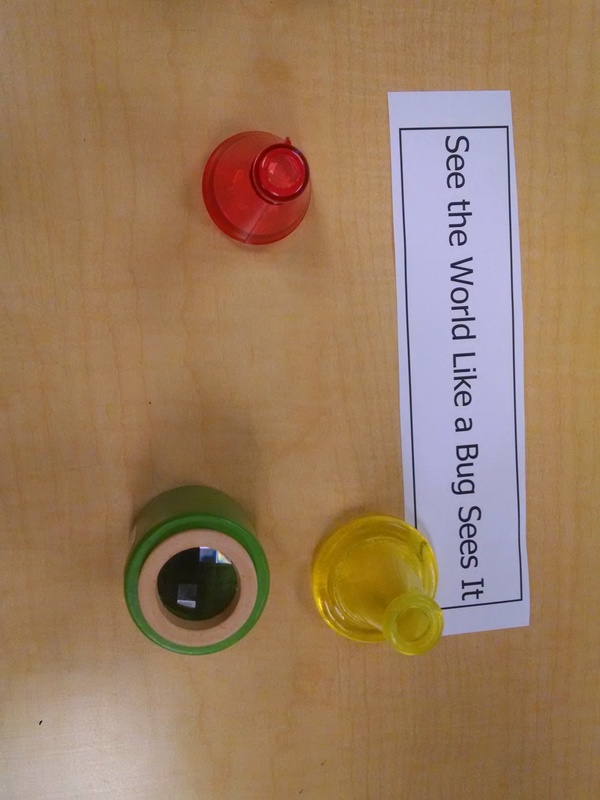 This time, we had the bug eye lenses Bug Eye lenses, Cooties, Butterfly Puzzle and Bug Dominoes You could also bring in the Elefun game we used in Wind week, or combine the Elefun butterflies with the wind tube. Snack: You could do a dirt cup (chocolate pudding, crushed oreos, and gummy worms) or bugs on a log (use pretzels or celery as the log, spread on cream cheese or peanut butter or sunflower butter, then sprinkle on chocolate chips or raisins or dried cranberries to be the bugs.) Or pasta – see notes under more ideas below. We hid plastic butterflies and dragonflies out in the playground and went on a bug hunt. If you had butterfly nets, it would be even better. You can do a real bug hunt by flipping over rocks and pieces of wood, looking in trees and so on. Try a tree shake – lay out a white sheet under a tree, then shake the branch for a few minutes and see what all falls out of the tree and onto the sheet. Marble painting spider webs: Take a cake pan. Cut black paper to put in the bottom. Dip a marble in white paint. Roll it to make a spider web. Alphabet caterpillar: Cut out 26 circles of rainbow colors of paper. Write one letter on each. Cut out one more to be the caterpillar’s head with a face and antenna. 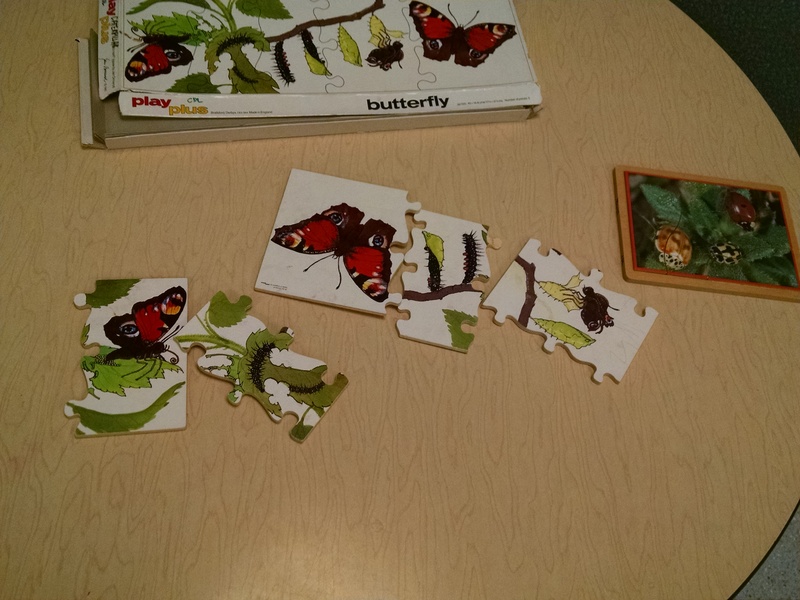 Kids assemble the caterpillar pieces in alphabetical order. Cricket noises. Put on a recording of cricket noises. Then explain how crickets make that noise and have kids try to replicate. The two methods I’ve see recommended are to rasp a nail file over the edge of a piece of cardstock, or rasp a comb over a stick. A really simple butterfly life cycle is to use pasta for the stages: orzo or acine di pepe for the egg, rotini or penne for the caterpillar, conchiglie (shell pasta) for the chrysalis, and bowtie for the butterfly. You could also use these shapes to make a fun lunch. Demo: As kids slowly come in to circle room, we demonstrate some of the activities that they’ll find in the classroom. 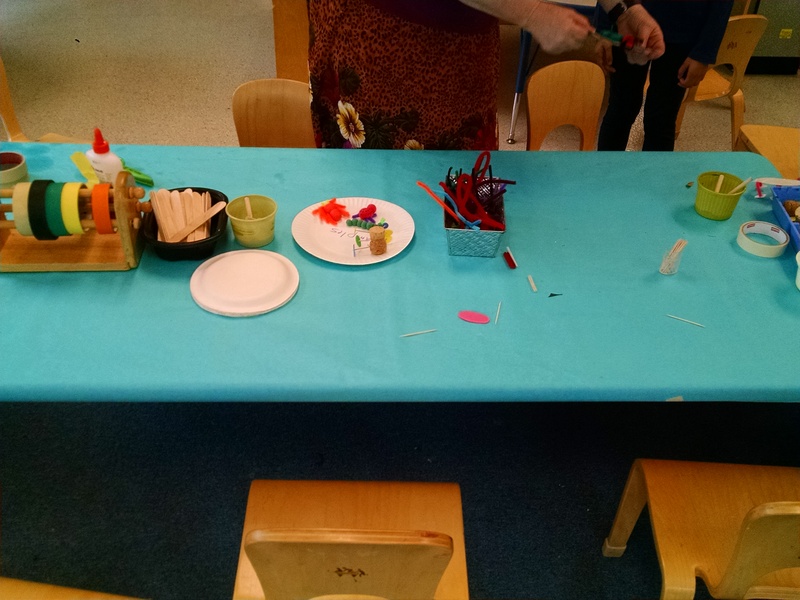 If you find there’s an activity which hasn’t quite caught kids’ attention during discovery time, this is a great time to show it to them and talk about it to encourage them to check it out after circle. Gathering: We always have a song, book, or rhythm activity to get kids’ attention focused and help them settle down. We read The Very Hungry Caterpillar (see below), which many of them were familiar with and loved seeing at class. 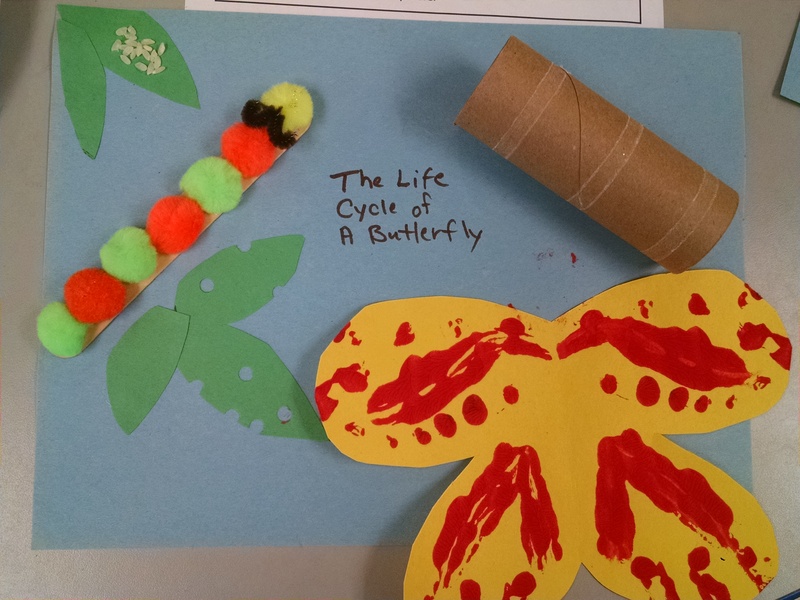 Discussion: We talked about the life cycle of a butterfly. I explained that butterflies don’t actually spin cocoons, even though many things (like today’s book and today’s song) say that they do. Moths spin silk cocoons. Butterfly caterpillars shed their skins / exoskeletons as they grow like many (all?) insects. When they are ready to become butterflies, they spin some silk to help them hang from a branch, split their skin, and then some gelatinous stuff forms, then hardens into a jewel like chrysalis. (For a good illustration and discussion of this, see Rockwell’s Becoming Butterflies (details below). Some butterflies make a pouch of leaves and form their chrysalis inside there. Song: I found this song on https://kcls.org/content/caterpillar-caterpillar-crawl-crawl-crawl/ but I added the first verse and revised some of the words a little so they scanned better to the music. Done to the tune of Frere Jacques / Are You Sleeping. Optional: you could combine this with the movement game, and have the kids pretend to be each of these stages of the life cycle. Caterpillar, caterpillar, curl, curl, curl, curl, curl, curl, curl up in your egg, curl up in your egg, curl, curl, curl, curl, curl, curl. Caterpillar, caterpillar, crawl, crawl, crawl, crawl, crawl, crawl, crawling on a green leaf, crawling on a green leaf crawl, crawl, crawl, crawl, crawl, crawl. Caterpillar, caterpillar eat, eat, eat, eat, eat, eat, eating leaves all day, eating leaves all night, eat, eat, eat, eat, eat, eat. Caterpillar, caterpillar, spin, spin, spin, spin, spin, spin, spin a silk cocoon, spin a silk cocoon, spin, spin, spin, spin, spin, spin. Caterpillar, caterpillar, sleep, sleep, sleep, sleep, sleep, sleep, sleep in your cocoon, sleep until you bloom, sleep, sleep, sleep, sleep, sleep, sleep. Discussion: We talked about (and drew on the board) how many body parts and legs insects, arachnids, and myriapods have. Song: From Growing Up Wild book. to the tune of Head, Shoulders, Knees and Toes. Head, Thorax, Abdomen; Head, Thorax, Abdomen. Book: We read (with feeling!) Argh Spider! Aaaarrgghh! Spider! by Monks. A lonely spider wants to be a pet, and does its best job to win over a family, who keep saying “argh! spider!” then “Out you Go!” Then the spider wins them over – there’s a lovely page with sparkly webs the spider has woven – and is a happy pet – until s/he brings over too many friends to play! It’s a really fun read-aloud. Also, at my parent education session that day, I had talked about emotional intelligence, and one suggestion I’d made to the parents is that when reading books, talk about the emotions of the characters – ask kids to notice expressions in the illustrations – ask “how do you think this character feels now?” And Argh Spider is a great book for illustrating just how this emotional literacy can be pulled into reading almost any great kids book. Good for ages 3 – 7. Waiting for Wings by Ehlert. Big book with big bold illustrations makes it great for circle time reading. Nice engaging words, with a good rhyme and rhythm. 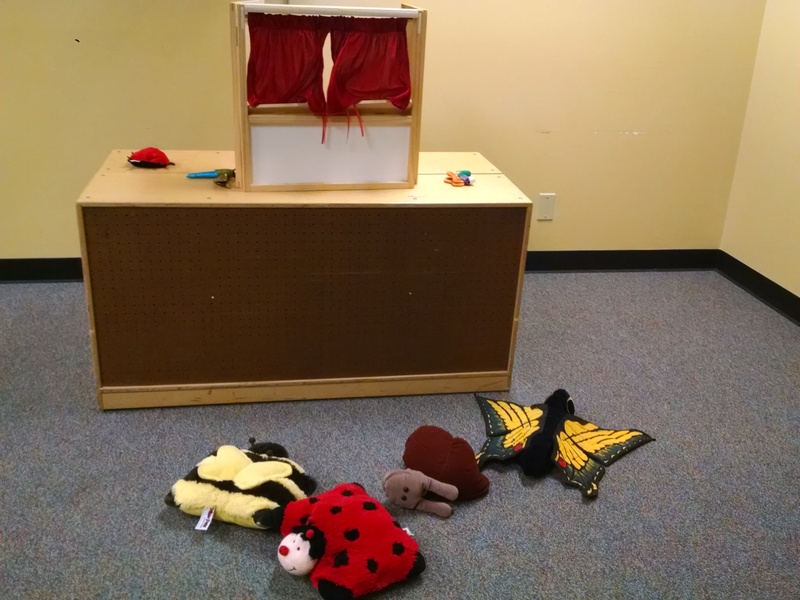 Tells the story of caterpillars hatching, eating, making a case (chrysalis), and becoming butterflies. On the final pages, we see pictures of several different species, where it shows what food they eat, what the caterpillar, chrysalis, and butterfly look like. Good for ages 3 – 6. 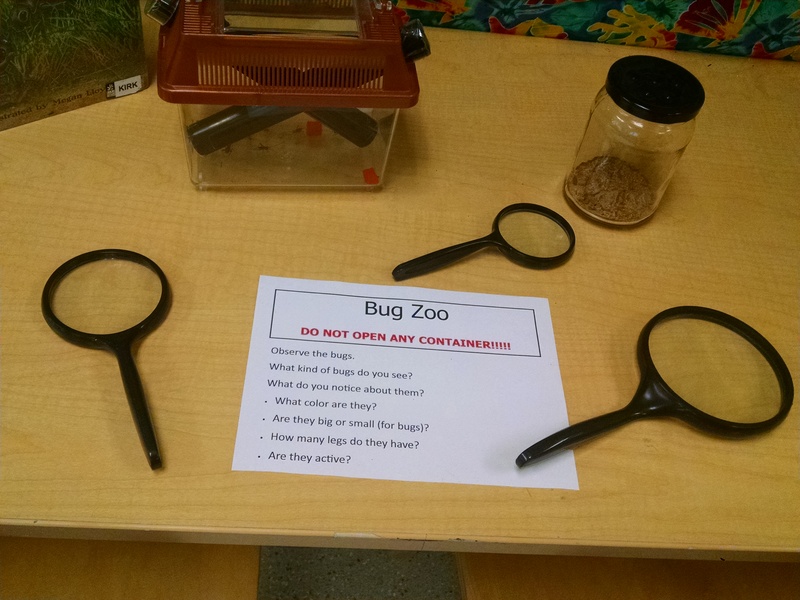 Bug Safari by Barner. A child goes on a safari through a “bug-infested jungle”. He follows a trail of ants, and they pass by many other insects like dung beetles, green mantis, and spiders. The ants lead him back to his own base camp, where they’ve discovered the family picnic! Engaging story, fun illustrations, and good info. At the back of the book, there’s more details about each of the bugs seen. Recommended read-aloud for ages 5 – 7. 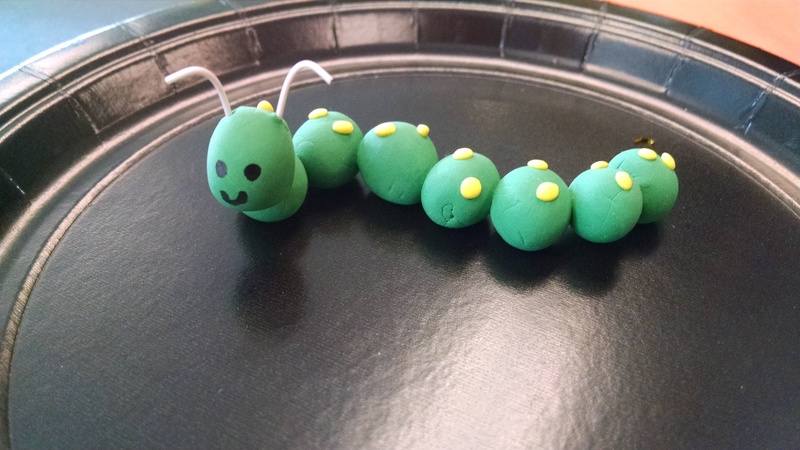 Ten Little Caterpillars by Martin and Ehlert. Another book featuring Lois Ehlert’s fabulous, vibrant illustrations – while not detailed naturalistic drawings, they definitely capture the essence of natural objects. I have to confess that when I read this, my first impression was that many of the caterpillars met a bad ending, and that maybe only number ten survived. I re-read it, and one through five were fine. Number 6 was carried off to school, number 7 met a hungry wren, the eighth was frightened by a hen, the ninth falls into the sea, right in front of a big hungry looking fish. I’m not sure whether or not these caterpillars survive those encounters – a kid might not have this question, but I notice it as an adult. Number 10 turns into a butterfly. And again at the back, there’s pictures of various caterpillars, butterflies and moths. Ages 3 – 5. Bugs! Bugs! Bugs! by Barton. Very bright, cheery illustrations. This could be a good book to put on the table at the bug factory, because if shows simplified versions of ladybugs, grasshoppers, bees and more. Fun circle time read-aloud for three year olds. 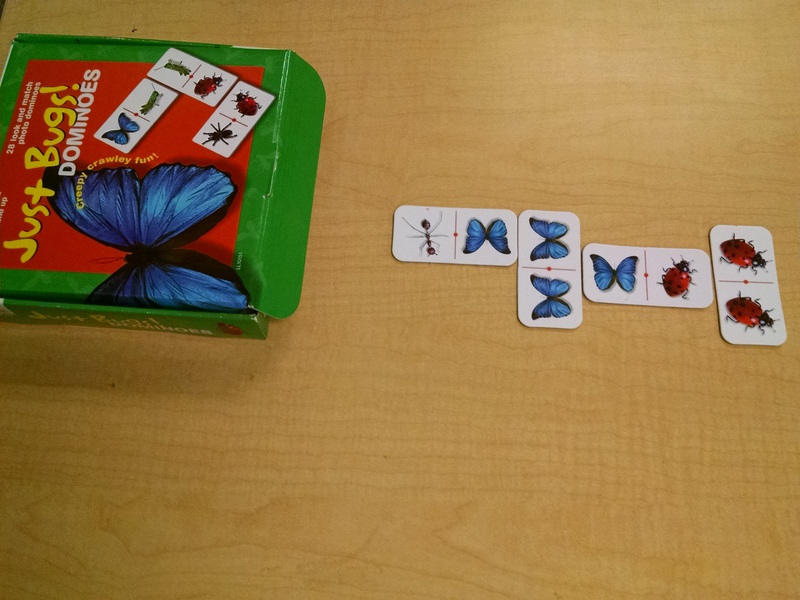 The bonus is the “bug-o-meter” chart in the back, which has 8 columns for 8 types of bugs, then 4 rows for “can it fly, where does it live, how man legs, and does it sting.” This was a great introduction to charts for my five year old, who figured them out quickly as I asked: “Can you tell me all the bugs that sting” and other questions. Inch by Inch by Lionni. A story about an inchworm who saves himself from being eaten by a robin by saying “I am useful. I measure things.” And he goes on to measure the robin’s tail, flamingo’s neck, toucan’s beak, and onward, until the nightingale demands he measure her song. He inches away. Nice illustrations, nice engaging story. Would also be fun to include in a class on measuring. Ages 3 – 6, nice read-aloud. Becoming Butterflies by Rockwell and Halsey. If you’re planning to get a Live Butterfly Kit, then I would absolutely get this book. 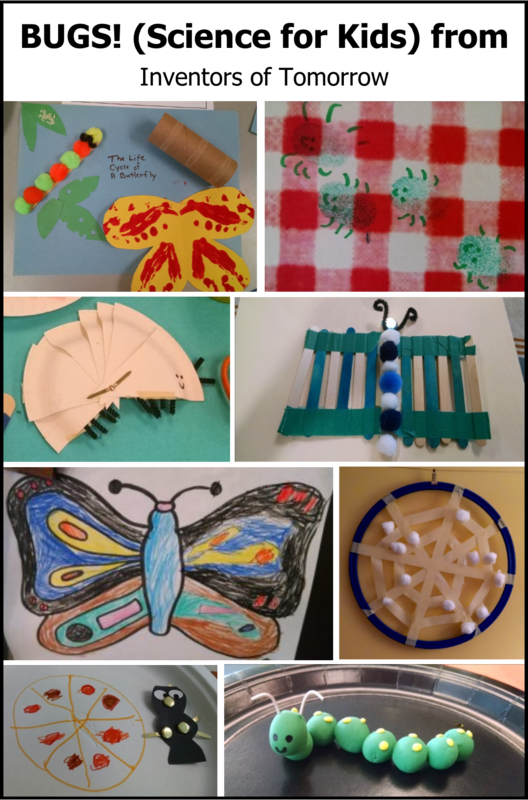 It tells the story of a preschool teacher bringing caterpillars into the classroom and the children watching them through the process of hungry caterpillar to chrysalis to butterfly and then releasing them. Ages 5- 7, unless you’ve got your own live caterpillars, in which case I think 3 – 4 year olds would engage in this book even though it’s longer than their typical attention span. Life Story of a Ladybug by Guillain. A non-fiction book – the words are best for ages 5 – 7. But the photos are great for any age. Great colorful up close photos. I like that this shows the life cycle of a ladybug from egg to larva to pupa to adult . 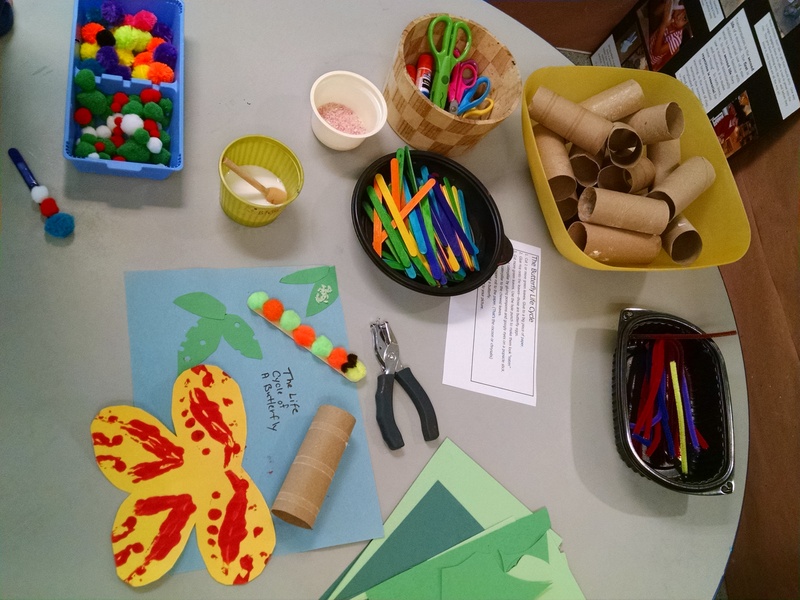 I think almost all preschool kids learn about the life cycle of the butterfly (and sometimes moths) but we rarely teach them that other insects go through a similar series of changes. Those Amazing Ants by Demuth and Schindler. Ages 6 – 7. A non-fiction book about ants, which summarizes lots of good information in an engaging, story-telling way. Great “up close” illustrations of ants. Shows life cycle of ant, from egg to worm to adult. Bugs Are Insects by Rockwell. A detailed non-fiction, for ages 6 – 7. Discusses anatomy of insects and how to tell insects from arachnids. It defines bug, saying “we sometimes call insects bugs.. a bug is an insect with a mouth like a beak and a head that forms a triangle” like stinkbugs, bedbugs and water striders. Chirping Crickets by Berger and Lloyd. A non-fiction book which tells the science of crickets in an engaging way. Ages 6 – 7. Caterpillar Shoes: Ok, the caterpillar is sharing its shoes with all the other bugs, so that part is completely scientifically inaccurate. But this is a terribly cute video and does introduce lots of different kinds of bugs. 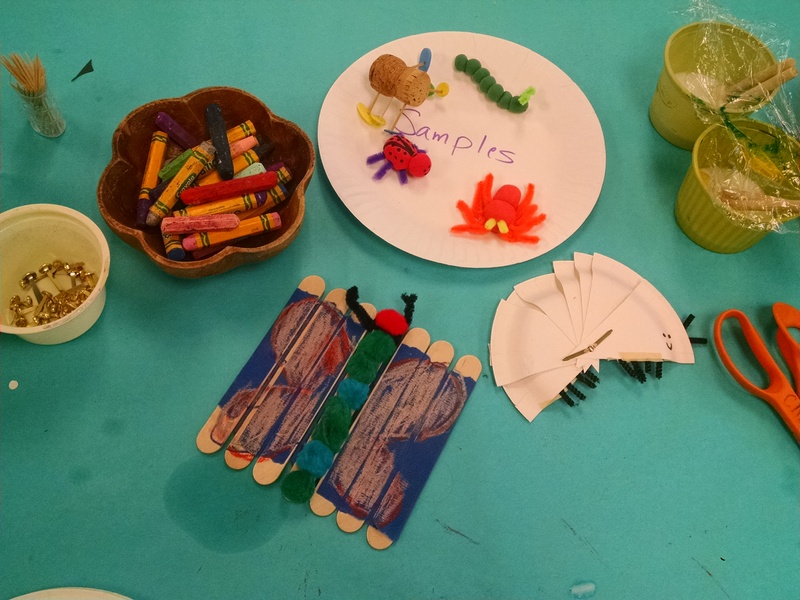 What is an Insect is a nice 2 minute video about the basic science of insects explained at a preschool level. All About Bugs is another nice video, though the speaking style is a little slow and overly enunciated. But the nice thing is that it has captions. If you have a child who reads, I like captions they can read along with as literacy practice. Most bug apps are about smashing bugs, killing bugs, and wars on bugs. There’s a Very Hungry Caterpillar app – a free version and a $3.99 version. I’ve only spent a few minutes with it, but it’s a nice educational game with a quiet peaceful tone – appears good for a 3 or 4 year old. I’m testing out Bug Village, which is about building bug villages.